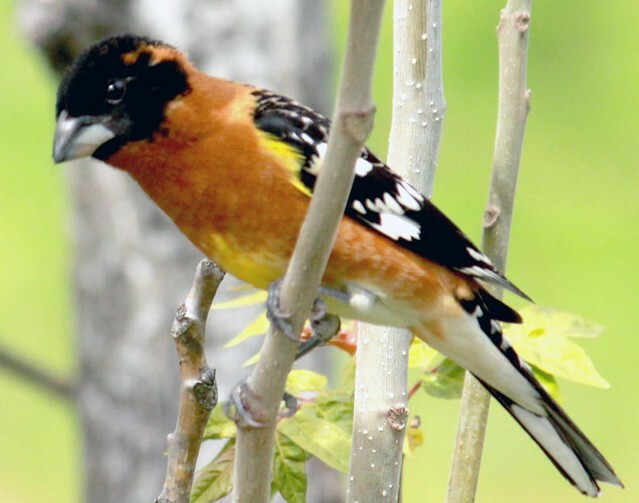 It’s a Black-headed Grosbeak and I’ve got the photograph of the female too I think. I’ll post it in the future. Looks like it could be a black hxeaded grosbeak db. The bill looks more like a cardinals than an orioles. Im jealous, i wanna see one! This bird is beautiful. I do wish this species were in my area. White wing tipped doves are eating on the feeder right now. Around 8:00pm every evening about 5 cardinals/redbirds come to eat. Some of these have grey mixed in with their red. Never though much about that last year because I thought the ones with the grey were the females. But one with a lot of grey that eats every evening I think is a male because he has the pretty head tuff feathers sticking up. One of the grey ones only has a few red feathers. She almost looks like a completely grey bird. I hope they will raise some young in a nest around here this spring and summer. I’d like to have more of them around. One male is so beautiful and bright red. I suppose he was the one I had here last spring and summer. I wonder why they only come to the feeder at dusk when it is almost dark? Maybe they come at dawn, too, but I’m not up to check that out. Perhaps the darkness helps hide them from predators. I’m liking the depth-of-field in that shot, it adds a lot of interest and context. Did you change lenses or is it just that your current spot has background foliage and the valley one did not? Hi Idervish, Larry we have green foliage as a back drop in this new RV park here. Pretty isn’t it. You are living a birdwatcher’s dream D.B. Munford, just keep feeding those Cardinals and they will return I’m sure. Your doing everything right it seems in attracting them to your feeders. Bytheway, Thanks for commenting. I love to hear what your seeing on your feeders.